Wall Tapestries by Sweet Jojo Designs are a quick and easy way to liven up the walls in any room. As a perfect alternative to messy wallpaper, wall tapestries create a sophisticated focal point for any bedroom, nursery, dorm or office. This modern wall decor comes in a wide variety of colors and exclusive patterns giving you endless interior design possibilities. Tapestry Measures 60in. x 80in. Love the fabric style? Sweet Jojo Designs also makes coordinating bedding and decor accessories. 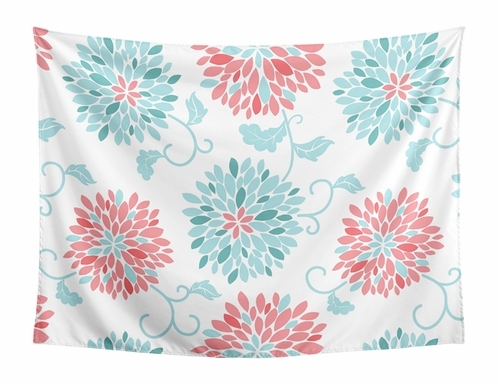 Turquoise and Coral Floral Wall Hanging Tapestry Art Decor for Emma Collection by Sweet Jojo Designs - 60in. x 80in. Home > Kids Room Accessories > Wall Decor > Large Wall Tapestries > Turquoise and Coral Floral Wall Hanging Tapestry Art Decor for Emma Collection by Sweet Jojo Designs - 60in. x 80in.